14 September 2018 Update: We’ve recently learnt that the black backpack that was featured in Season 3 of Running Wild with Bear Grylls was only a prototype. But we have received confirmation that new packs ARE coming by Spring 2019! Stay tuned for more information! So what gives? I did quite exhaustive research over the last year or two trying to sort out why more haven’t been made to keep up with demand. Not too terribly long ago I think I traced the manufacturing of that product line to a company who I think is the correct one. If so, it looks like they went bankrupt, which may explain the complete drop in production. I was also able to track down their new website which had no contact information whatsoever, but did appear that they were working on making a comeback. I didn’t think much of it at the time, because obviously, that certainly didn’t mean they would be involved in manufacturing more of the Bear Grylls outdoor and camping gear that we love. Look what she has on her back! That is a bloody new Bear Grylls 28L pack! All black with orange highlights! Bear Grylls logo and a lovely 28 near the bottom of the pack! 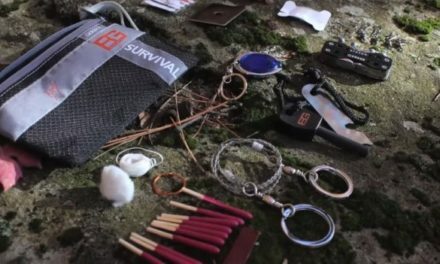 Does this mean we are going to see a new range of Bear Grylls products soon!?! I hope so! They look exactly the same. The Odyssey 50 is an outdated pack. Did they rebrand it and repurpose it for a future Bear Grylls backpack release? Or did someone at the academy just smack a Bear Grylls logo on the bag (maybe because all of the 60L packs have been sold out! haha)? I would expect that a new pack would follow a similar design to the new 28 – but either way, this is exciting! The old 28L was my favorite pack – I’ll definitely be getting the new one! Make sure to follow my Facebook page for updates! I hope so. They’ve been using the pack for quite a while within the BG organization. They just started releasing a few products from BG Ventures so hopefully the packs come soon!